How to change the BBCode button images? Here you go! The tutorial was tested on this forum and with the browser Google Chrome; If you notice that the tutorial doesn't work for a browser or for a version of forum (PhpBB2, PhpBB3, PunBB, Invision) contact an administrator and we will fill this field with your reporting. 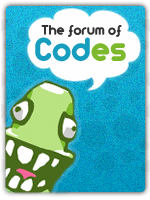 The team of the Forum of Codes. » BBCODE Image with Hover Text?